The simple short circuit and overload protector design presented here can be used for protecting valuable mains operated gadgets like amplifiers, TV sets, DVD players or any other similar appliance. The circuit was requested by Mr. Ashish. I really found very very useful circuits in your blog and I have tried most of it , Thanks for that . I have made a 150 Watt Mosfet Stereo Amplifier and I was searching for a good, simple short circuit protection circuit for this amp , I only found protection circuit for speakers in your blog and I have added it . My amplifier runs at +/- 36 V and I really needed it as I live near a village where there is lot of Power problems . Can you help ???? Normally all sophisticated gadgets today incorporate an in built short circuit protector arrangement, yet still adding a more comprehensive external protection device could only benefit the connected system. Moreover, for gadgets such as amplifiers which are home built this protection device could prove to be very effective and useful. Also for an hobbyist who prefers building electronic gadgets at home could be greatly benefited with the present idea. The presented short circuit protector design works on a very basic principle and costs not more than a couple of dollars. Let's learn the functioning details of the proposed circuit. On applying power, the high current from the 220V input is dropped sufficiently by C1, rectified by D1 and filtered by C2 to feed the gate of the triac T1. 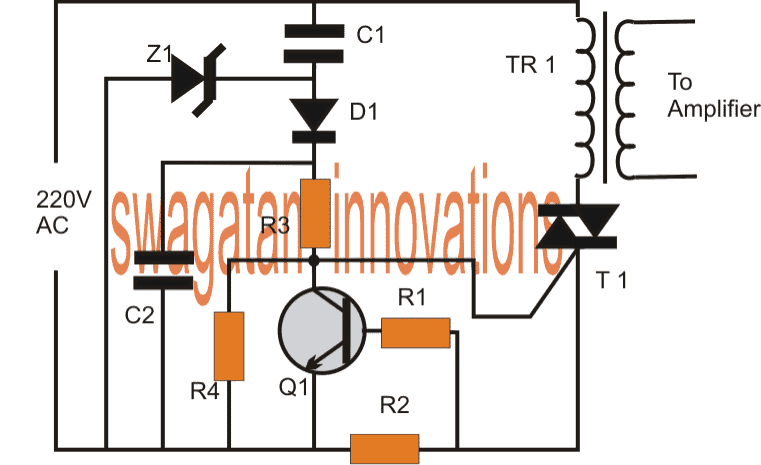 The triac conducts and switches ON the connected transformer primary thus switching ON the load which in this case is a power amplifier. The transistor Q1 along with R1, R2 forms a current sensor stage. R2 specifically is chosen such that it develops adequate voltage across itself at the specified dangerous high current threshold. As soon as the triggering voltage accumulates across R2, Q1 activates and sinks the gate voltage of the triac to ground making it switch off. The regulation continues as long as the short or overload condition is not removed. The above short circuit regulation ensures that the current level above the specified dangerous level is restricted safeguarding the precious devices associated with the connected amplifier. If a latching feature is required for the above design, the emitter Q1 can be configured with an SCR and the SCR can be used for latching and switching off the triac. TR1 = As per load requirement specs. Thanks for the circuit Swagatam . In the formula given above , what value of current should be taken . Is it the value of current rating of Transformer ? or less ?? I posted this circuit for you. I couldn't find your comment so couldn't remember the details and therefore couldn't mention it in the post, anyway it's for your application, you may try it. The current is the short circuit current which needs to be controlled. The best way to identify the current is to put an AC ammeter in series with the transformer primary winding and putting a short circuit condition at the secondary. The reading obtained over the meter can be considered as the determining current threshold. I have the updated the comment in the above article. The 0.22uf capacitor will drop the voltage to the safe levels. Yet for extra safety you may connect a 12V 1watt zener parallel to C2. The threshold cut-off current will need to be identified with the help of the procedure explained in the previous comment, it is the easiest way to do perhaps. Thanks Swagatam , If secondary of trafo is shorted will it harm the trafo ?? And what wattage should be the resistors ? D1 can be 1N4007 right ?? You would have to do it only for a couple of seconds until you get a proper and clear reading over the connected meter, so for this short period of time it won't affect the transformer.